If you are like most Americans, you filed your tax return in mid-April and did not look at any of it during the last four months. The tax preparation which seemed so valuable at the time has faded like Dorothy’s memories of Oz when she wakes up back in Kansas. Many people who use tax computation software don’t even understand the changing structure of our country’s tax code. You fill in the blanks, press compute, pay the tax, and then forget about the torture until next year. The obfuscation of the tax code helps hide the details. Its Byzantine rules and regulations are carefully crafted to cover up just how much we pay each year. In other words, tax laws are stupid by design. While you are busy trying to translate word problems written in ‘Taxglish’ you don’t realize they are asking all the wrong questions. Like Dorothy in the field of poppies, you can’t seem to stay awake long enough to realize the danger. Still, as long as you are so close to the Emerald City, it would be nice to have Glenda send a rain to help you get inside the city’s gates. Similarly, a basic understanding of the specific contours of the stupidity of the tax code can help you avoid meaningless extra payments to the government and keep more of your income. A professional tax expert can help you get the right deductions, but likely won’t motivate you to keep the right records unless you understand the benefit for yourself. All deductions are not created equal. Some deductions are more valuable than others. What matters is whether or not the deduction is “above the line” or “below the line”. The line in this case is your adjusted grow income (AGI). Above the line deductions include everything on Schedule C or F business deductions. If you are not a small business owner, you should consider performing some or all of your work under the umbrella of your own small business. 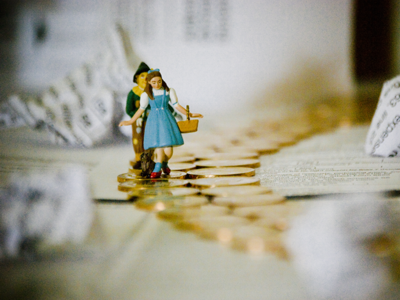 If you run a successful business you will be paid twice what you are currently being paid and find yourself on the yellow brick road of accumulating real wealth. Even if you don’t get any more pay, you may find more of your expenses are tax deductible and therefore you will pay less tax. With the savings on your insurance premiums, you should be able to accumulate a sizeable nest egg. And, unlike your traditional health care plan, your HSA funds are not subject to a “use it or lose it” policy. Anything you don’t spend one year carries over to the next year. After all, it’s your money. In addition to doctor’s visits, hospitalizations, lab tests and the like, an HSA can also pay for prescriptions and some over the counter drugs like aspirin with pre tax dollars. HSA accounts can even pay for vision and dental expenses such as contact solution and teeth cleanings. These deductions are like Dorothy’s ruby slippers, they are adjustments to your income and once adjusted nothing else in the tax code can touch them. Fund your retirement account, start a health savings account and go into business for yourself to take advantage of these incentives in the tax code.